FERC just directed Sabal Trail to actually address problems raised by citizens and local government agencies, plus numerous discrepencies FERC itself detected. Opposition to this unnecessary and hazardous fracked methane pipeline is having effects, even with rubberstamping FERC. But watch out Tifton, Valdosta, Thomasville, and The Villages! You’re now on possible routes. Sabal Trail is to provide details for Greenlaw’s route-around-Albany proposals on behalf of Sierra Club and others Valdosta, you’re back in two proposed routes, the the one you saw last summer, plus one down I-75 that would go right past Lowndes High School and also past The Villages in sinkhole-prone Sumter County, Florida. Tifton, you’re not safe; look at that Hillabee route. Thomasville watch out: you’re on a new proposed route. 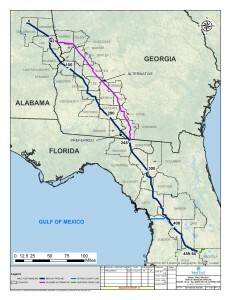 Sabal Trail is to provide alternatives to minimize effects on or completely avoid the Withlacoochee River, and this is even before the Hamilton County Commission’s resolution against the pipeline gets to FERC. FERC’s letter is peppered with requirements to cooperate with federal, state, and local agencies especially including about land use and environmental requirements and land approvals.